Douglas MacArthur, “Douglas MacArthur,” Histories of the National Mall, accessed April 23, 2019, http://mallhistory.org/items/show/115. In 1932, MacArthur was the Chief of Staff of the Army when a group of veterans called the Bonus Army converged on Washington to demand payment of bonuses by Congress. On July 28 the protesters clashed violently with police, resulting in the death of two men, William Hushka and Eric Carlson. President Hoover ordered General MacArthur to evict the protesters. Accompanying the troops, MacArthur was present as they advanced using gas, tanks, and bayonets to clear out protesters who fought back with bricks and rocks. Though no shots were fired, the event hurt MacArthur’s public image. National Archives at St. Louis. View original photograph. Born into a military family, Douglas MacArthur continued the family tradition of distinguished service, serving in World War I, World War II, and the Korean War. 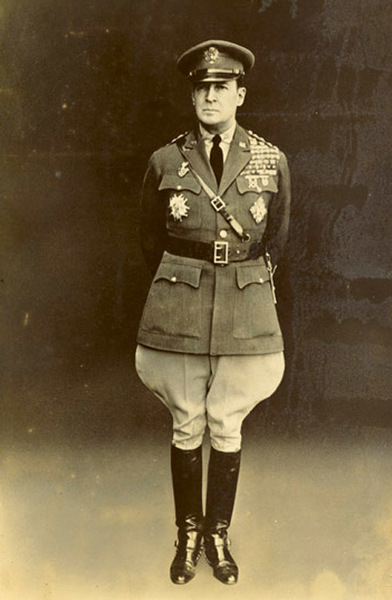 In 1925, MacArthur became the youngest Major General in the US Army. During the 1930s, MacArthur served as Chief of Staff of the Army and helped to organized the Civilian Conservation Corps, which created jobs through public works projects during the Great Depression. A few of his many distinctions include receiving the Medal of Honor, becoming the only man ever to become a field marshal in the Philippine Army, and being one of only five men to ever rise to the rank of General of the Army. Additionally, MacArthur oversaw the occupation of Japan after World War II.